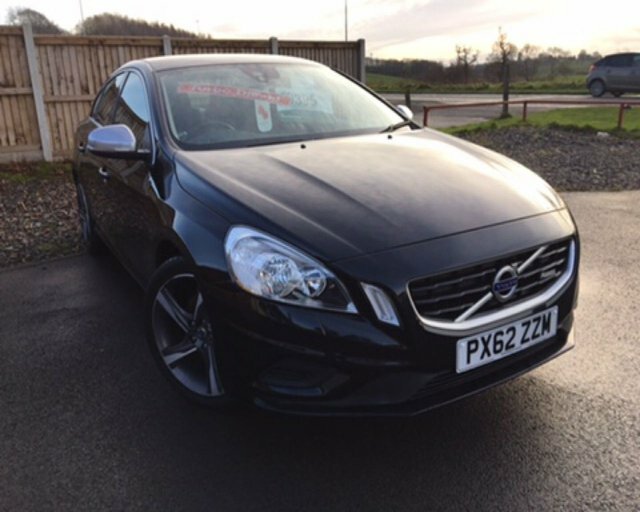 FRESH IN TO OUR STOCK IS A VOLVO S601.6 DRIVE R-DESIGN 4-DOOR 115 BHP 6-SPEED MANUAL, FINISHED IN BLACK SAPPHIRE METALLIC WHICH IS COMPLIMENTED BY A BLACK CLOTH/LEATHER R-DESIGN EMBOSSED UPHOLSTERY. THE CAR HAS HAD ONLY ONE PRIVATE OWNER FROM NEW & IT COMES COMPLETE WITH A FULL SERVICE HISTORY UP TO 01/11/2017 @ 33142 MILES WHICH BACKS UP GENUINE LOW MILEAGE ! DUE TO THE EXTREMELY LOW CO2 EMISSIONS, THE ROAD TAX IS ONLY £30 PER YEAR ! STANDARD SPECIFICATION INCLUDES 18 INCH 5-SPIKE ALLOY WHEELS, CRUISE CONTROL, AUX PORT, DUAL ZONE CLIMATE CONTROL, HEATED FRONT SEATS, ELECTRIC WINDOWS, ELECTRIC MIRRORS & IT HAS TWO SETS OF REMOTE KEY FOBS. Beautifully sleek and an absolute joy to drive, the Volvo S60 is a car that will never fail to bring a smile to your face. Comfortable too thanks to the car's wonderfully refined interior, it's a true class act. Sophisticated suspension and sharp steering add to the experience behind the wheel, while Volvo's range of economical engines help to keep emissions and running costs down. Find out more about the full range of used Volvo S60 models for sale in Penrith by contacting a member of the team. You can also view the latest stock available at Intercars of Penrith Ltd right here on the website.